The Comfort London Hotel Notting Hill is well located in a quiet residential neighbourhood while providing easy access to London’s tourism, cultural and business points of interest. 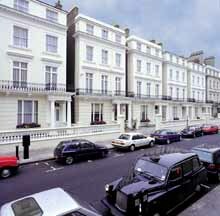 Buckingham Palace, Chelsea Football Club, the London Eye and the Natural History Museum are located close to the Comfort London Hotel Notting Hill. Accommodations at the Comfort London Hotel Notting Hill are comfortable, convenient and provide a sense of homeliness that visitors desire so much. All guest rooms at Comfort London Hotel Notting Hill provide a wide array of in-room amenities that collectively allow guests to work, relax or indulge in both while pampered in total comfort. These amenities include complimentary newspaper, hairdryer, laundry service, coffee maker, safe-deposit box, iron and ironing board, and high speed Internet access. The availability of Internet access will be particularly useful for corporate travellers who need to stay productive during their travels. Furthermore, the Comfort London Hotel Notting Hill offers additional business services in the form of fax and copying service. Secretarial service is also available for the convenience of business travellers. London is one of the world’s most loved cities, where historical charm goes hand in hand with a modern cosmopolitan charm to offer a unique destination unlike any other. Visitors to London will find the Comfort London Hotel Notting Hill to be ideally suited to the best that London has to offer. Comfort London Hotel Notting Hill provides guests with many in-room amenities.